The Black-breasted Parrotbill is a rare and very local endemic of northeastern India. Its range once extended from e. Nepal to Bangladesh but there are apparently no recent records outside India. Birdlife International's (2000) Threatened Birds of the World lists this species as "Vulnerable" with the world population estimated at 2,500-10,000 birds and declining. The species is threatened by habitat loss and degradation but is apparently still found in three parks: Kaziranga, Dibru-Saikhowa, and D'Ering Wildlife Sanctuary. We were quite interested in searching for it during an April 2001 visit to Kaziranga National Park but almost all the information we could find indicated that chances there were very poor. The annotated checklist for Kaziranga (Barua & Sharma 1999) indicated it was only an "occasional resident" and listed but two recent sightings. 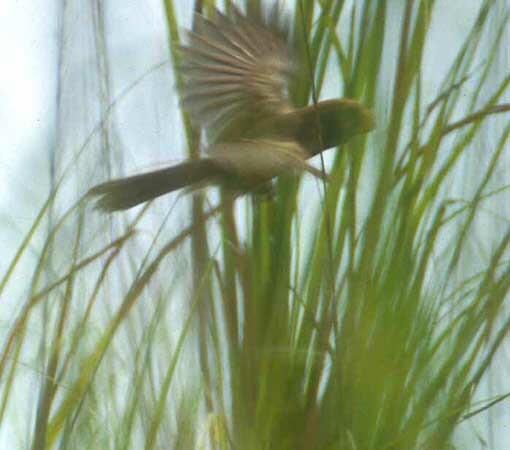 One of those was of a pair at Debeswari on 27 Mar 1998 by the authors who said "a subsequent search in the area revealed that the birds were partial of Phragmites reeds on which the birds seem to feed." Prior to the trip we had been fortunate to obtain a recent tape-recording of this species from Dibru-Saikhowa Park, Assam, by Craig Robson. One of our group (Stephen F. Bailey) had transferred the recording to minidisc. Before we reached Kaziranga we happened to run into a tour led by David Bishop who told us he had also had the birds on Debeswari [it now seems this habitat is considered a regular spot of this rarity by tour leaders]. Debeswari is a seasonally-flooded island in the Brahmaputra River in the eastern range of Kaziranga; during the dry season it provides extensive grassland habitat intersticted by swathes of tall elephant grass. 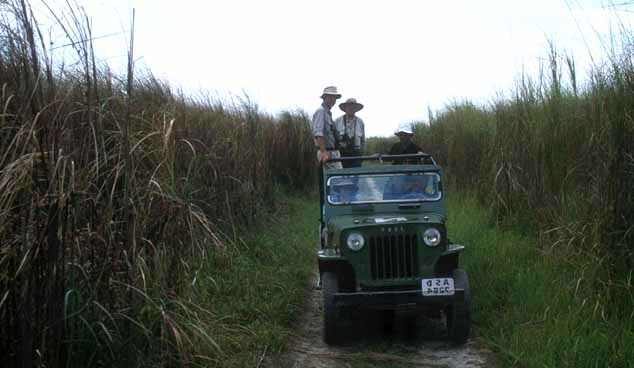 David Bishop had told us to try our tape when we found elephant grass towering over the road. Humming the song from "Oklahoma" in my head, I searched for a spot where the "reeds were as high as an elephant's eye." This is the spot we picked (below); in the jeepbed are Dan Singer in upper left, Steve Bailey & our guide and the requisite park guard (hidden because he is seated); Rita Carratello and our driver are in the front. We did not think we'd be successful in finding this bird but we stopped and tried the tape. To our astonishment a pair responded and began circling our jeep, providing only the briefest of glimpses as they moved from reed to reed -- almost always staying below the reedtops -- or dashing across the road. It was nearly impossible to get a decent view or even put one's binocular on a bird, yet somehow by standing up on the jeep's rail I managed to snap the 3 photos shown here. If one checks out the field guide paintings in Grimmett et al. (1998, 1999) or Kazmierczak (2000) it is easy to see why this would be one of the most sought-after parrotbills. It is large and has a huge bill and striking head/breast pattern. Its overall coloration is a deep rufous -- not quite captured in these shots in backlit conditions -- so that it is impressive even when darting across the road. Our birds seemed clearly paired. We avoided using the tape much after the initial encounter but soon the birds began dueting. Steve Bailey was able to make a lengthy recording of his own of vocalizations that are described by Barua & Sharma (1999). When word reached the director of Kaziranga Park that we had recorded this rarity, he arranged to have us meet him at his office to hear the story (and Steve will provide the Park a duplicate tape in due course). Tourists are not generally allowed in the eastern range of Kaziranga but the director told us that serious birders are the exception. Permits, however, must be obtained in advance (usually a day or two in advance in our case). Although considered primarily resident "there is some indication that it makes local seasonal movements in response to the rainy season" (Birdlife International 2000). Since Debeswari is innundated during the monsoon (June-October) it must be assumed that the birds here move elsewhere during the summer/fall. However, statements elsewhere in the literature that suggest the species uses other habitats besides the elephant-grass reedbeds and that it ranges up into the foothills to 2400m elevation in the non-breeding season are now considered questionable (fide C. Robson). We had a variety of other tall grass specialists in this area but none of the other endangered species that occur here occasionally. We did have a pair of babblers respond to a tape which included Jerdon's Babbler Chrysomma altirostre but never got adequate views, and thus cannot rule out other babblers on the same tape (Chestnut-capped Babbler Timalia pileata or Striated Babbler Turdoides earlei; we observed these elsewhere on Debeswari). 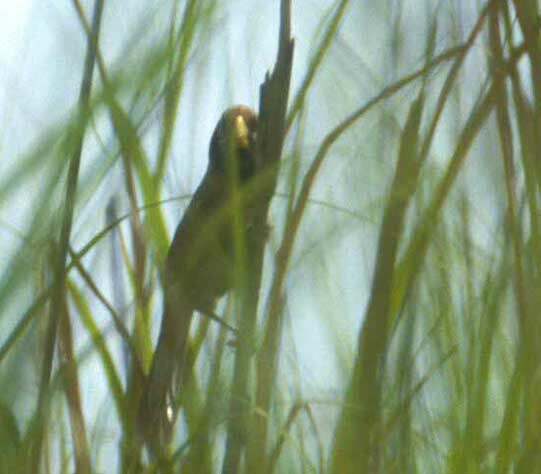 Marsh Babbler Pellorneum palustre or Slender-billed Babbler Turdoides longirostris have occurred in Kaziranga -- also rarely -- but we had inadequate time for anything approaching a survey. We felt exceptionally fortunate to find these parrotbills. PHOTOS: All photos on this page are © 2001 Don Roberson; all rights reserved. 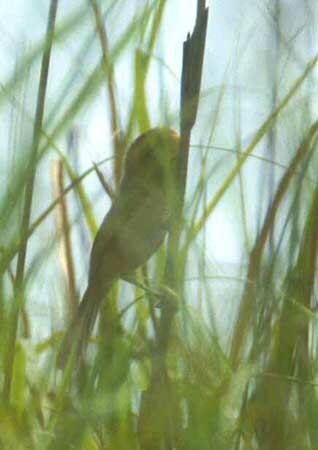 This Black-breasted Parrotbill was photographed at Kaziranga National Park, Assam, India, on 1 Apr 2001. Ali, S., and S. D. Ripley. 1987. Compact Handbook of the Birds of India and Pakistan. Oxford Univ. Press, Delhi and Oxford, U.K.
Barua, M., and P. Sharma. 1999. Birds of Kaziranga National Park, India. Forktail 15: 47-60. Grimmett, R., C. Inskipp, and T. Inskipp. 1999. Birds of India, Pakistan, Nepal, Bangladesh, Bhutan, Sri Lanka, and the Maldives. Princeton Univ., Princeton, N.J.
Kazmierczak, K. 2000. A Field Guide to the Birds of the Indian Subcontinent. Plates by B. van Perlo. Yale Univ. Press, New Haven, CT. I thank Ian Lewis, Craig Robson, and Dan Singer for comments on a draft of this page.